Excellent!! The cable is surprisingly thick! After not being able to run 60HZ with 4K or even 1440p 60HZ over my regular high speed HDMI with Ethernet I decided to see if a higher speed cable would work. 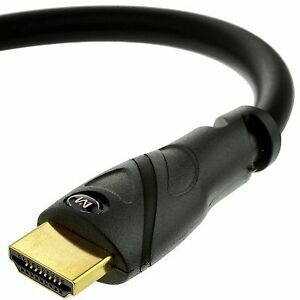 In this case the 18gbps Mediabridge cable is the one to get. Depending on the TV you have you may need to go to settings and turn on enhanced hdmi to be able to use 4K at 60HZ. Some TV's may have this turned on by default and not require any changes in settings. I am not sure but I think for 4K at 60HZ "with 444" capability you may need to run the TV in Game mode to unlock the 444 color. On my PC in the NVidia control panel I am able to select 4K 60HZ, 1440p 60HZ etc and able to use any of the color options like 4.4.4, 4.2.0 and 4.2.2. Previously with my old high speed hdmi that is not 4K certified I was not able to get 60HZ on most resolution settings. Only on 3820x2160 I was able to get 60HZ but not on any other resolution. The option to use any other resolution was present but when activating it, my screen would go beserk. Older 4K TV's may not support 4K at 60Hz only at 30Hz. Just recently bought a new 4k TV and it worked great. Even improved picture on an older 1080i TV. Highly recommended. This is a good quality cable with all the extras for even 3D productions. Looks solidly built. Should work well for a long time.